The Sacrament of Confirmation, Presenter’s Guide is designed to help the presenter or catechist deliver effective lessons, while engaging students in discussions and activities. It conforms to the translation of the Order of Confirmation that was implemented March 25, 2015, and authorized by the Congregation for Divine Worship and the Discipline of the Sacraments. 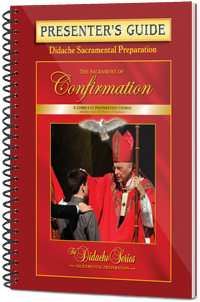 This presenter’s Guide was made at the request and under the direction of directors of religious education and other educators who are responsible for preparing young people to receive the Sacrament of Confirmation. We hope this Presenter’s Guide will help you prepare for your classes with your confirmands. Please accept the activities and other elements as suggestions; you know best how to share this knowledge with the people under your care. Remember to focus, as the text does, on the gifts of the Holy Spirit and to encourage parents and sponsors to become more actively involved in their confirmand’s lives, to help them to become more Christlike, and to grow in holiness during their spiritual journey on earth.